Six years ago, the historical society opened the doors of the museum to the public. A lot has happened since then. So many of artifacts have been collected, and interesting exhibits have been opened. The society has hosted some great events, and earned a presence at the Ronald Reagan Presidential Library. There is also a presence on the worldwide web, and at many, many community events. Much of this is done through member support. The donations made by the scores of active and retired officers permit the historical society to operate a full-time museum, as well as a fleet of historic vehicles and a host of other ventures. The society is dedicated to bringing the achievements of others to the fore. Annually we do this through Jack Webb Awards. This year, the society recognized a group of honorees who truly distinguished themselves in the law enforcement community. Two very recognizable and tireless friends of the Department were honored for many, many years of distinguished service. The third recipient was honored in the spirit of Jack Webb himself. All met at the Sheraton Universal hotel where the bestselling author, James Ellroy, hosted the awards ceremony. Jane Boeckmann, an accomplished businessperson, and very active community member in the San Fernando Valley has stood beside the Department in good times and bad. Jane is a true professional who is known for her publishing efforts and the loads of good work she has done for the Department and a variety of other causes. She stood out in a very crowded room. Both classy and caring, it was an honor to recognize a devoted family woman for her sustaining support of the Department. Jack Giroud’s sustaining support of the Department exceeds the half-century mark. Jack recently joined the ranks of the retired after 51 years of service, chiefly as a detective. Jack is known nationally for his investigative prowess that has taken him to many places and helped him solve many cases. Although his service started during the Dragnet days, his talents and methods were far superior to those of his television counterpart. Just as the legacy of Joe Friday endures so will Jack Giroud’s. Jack has trained many detectives ensuring that tomorrow’s robbers and thugs will have no safe haven. The historical society’s recognition of Jack Giroud’s contribution to the law enforcement profession was a natural. Jack deserved it. When Jack Giroud started solving crimes, the technology showcased by the television show, CSI, was not even someone’s brainchild yet. Now, it is the way of the future. The show blends the work of scientists and cops to solve crimes with modern and arguably futuristic results. Like Dragnet and Adam-12, CSI has captured a wide audience and holds them riveted while a crime is solved. The show has served law enforcement well. A new interest in serving, particularly in the police application of forensic sciences, has developed. In a day and age when recruiting cops is tough, it is important to have a mass media appeal. Dragnet did it in the fifties and sixties and CSI is doing it today. The historical society sees the spirit of Jack Webb in the accomplishments CSI has brought to the profession. Accordingly, the cast and crew of CSI were honored with the final Jack Webb Award. 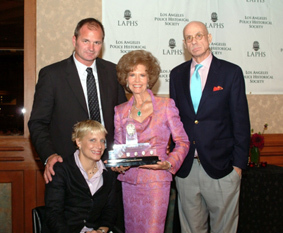 Jane Boeckmann receives the 2007 Jack Webb award from Officers Tim Pearce and Kristina Rippati. Bestselling author James Ellroy hosted the annual LAPM event. From the feedback of so many of those in attendance at the ceremony, the evening was an overwhelming success. We need to say thanks to a whole host of people, starting at the top. Chief Bratton and Rikki Klieman have been consistently gracious and thoughtful, and we were thrilled they attended. District Attorney Steve Cooley also consistently lends his support, both personally and professionally. First Assistant Chief Jim McDonnell and his wonderful wife helped support the efforts. Commissioner Alan Skobin headed the honorary dinner committee, which was co-chaired by Russ Colvin and Danny Staggs. Each of them is deserving of our thanks. So, too, is retired Chief Daryl Gates, he and Gina not only look great, they do so many great things to help out the society. James Ellroy came through again. All know he is a talented writer, those in attendance found out that he is equally adept at speaking. We thank James for his sustaining support. Undoubtedly the special moment experienced by all was the presentation of the Jack Webb award to Jane Boeckmann by Kristina Ripatti and Tim Pearce. A touching moment made possible by many people, including the Boeckmann family. Kristina is a reflection of the courage exercised by the men and women of the LAPD on a daily basis. The historical society extends its thanks to Kristina, Tim, and the Boeckmanns. It is also our pleasure to acknowledge and thank the tremendous organizations that support us and the LAPD. First and foremost, the Los Angeles Police Protective League. Their efforts went above and beyond. The same is true with the Los Angeles Police Federal Credit Union, the Command Officers Association and the Los Angeles Police Revolver and Athletic Club. These are true partners whose association and loyalty in this endeavor are greatly treasured. Finally, we need to acknowledge our partners from the museum volunteer corps. Keith Ricks, Joel Montes de Oca, Angie Roman and Lorena Walsh all gave of their weekend to assist us. This was a team with many members, all of them talented and thoughtful. For this we extend our thanks, and hope they will all be aboard for next year’s event. 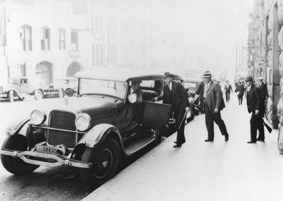 Detectives, circa 1930s, load up with vintage weapons in hand. A newly acquired Department shotgun of the era is now on display at the museum. Scott La Chasse arranged for our appearance. He is deserving of our thanks, along with Tom Hays, Greg Meyer, Gustie Bell and Margie Regan, all of whom helped staff the event. We have also made appearances at the Department’s citizen police academies, and some local speaking engagements, where we share the Department’s history increase the public awareness of the museum. Currently, we are preparing for the reappointment ceremony for Chief Bratton. The society will be rolling out some artifacts related to past chiefs to display at the ceremony. We are fortunate to have some interesting material from our early chiefs that should prove interesting to those invited to the ceremony. Some other interesting material was recently incorporated in two existing exhibits. Chief Deputy Joe Smith of the Santa Barbara Sheriffs Department recently passed along a revolver carried by one of the Bakersfield police officers involved in the capture of Onion Field Killer Jimmy Lee Smith. The handgun is now on display along with a written history of the weapon. So, too, is another weapon, a Remington model 31 pump action shotgun. Remington manufactured this gun from 1931 to 1949. During that period, the Department had an inventory of these weapons for officer’s to check out on an as-needed basis. The receiver of these shotgun were marked, “Police Gun—Los Angeles Police Department,” to distinguish these weapons from all others. Earlier in the year we were contacted by Officer Victoria Massengail of the Sacramento Sheriffs Department who was committed to getting the shotgun to the historical society. With the help of Officer Ron Evans, we not only completed the acquisition, but we also put the weapon on display with other period firearms. This is a unique acquisition that we were able to achieve through the cooperation of many of our law enforcement partners. Our thanks to Ron and Officer Massengail.